Astute readers will recognize that we recently posted two reviews covering more of the stack of AMD processors with the codename 'Kaveri' which covered the A6-7400K, A8-7650K and the A10-7700K in our recent coverage. Today we review the newest element that sits on top of all others, the A10-7870K Kaveri Refresh APU. 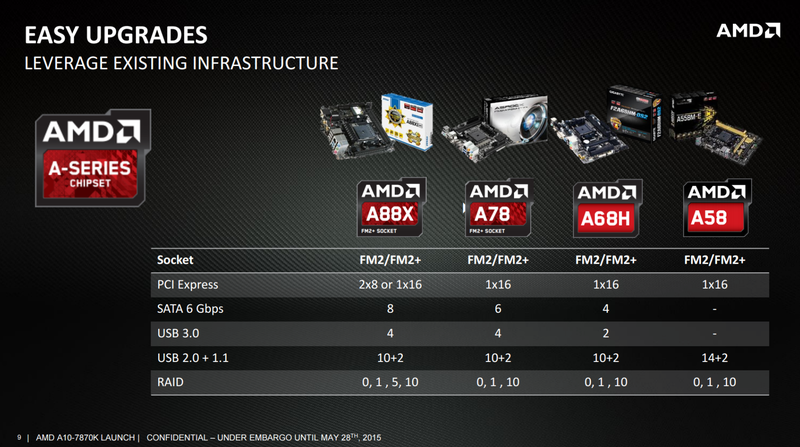 Rumors regarding an update to AMDs APU line have been permeating through the technology media for some weeks. Some seemed true, others obviously false and almost all posted without verification (which is the point where we at AT would post). However all of them revolved around the notion that AMD needed to update Kaveri, and perhaps pointing fingers at the new Excavator cores in the laptop focused Carrizo would be part of the line. 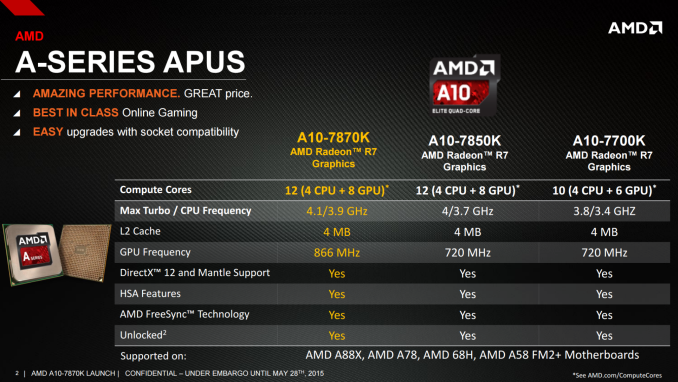 The A10-7870K is not a permutation of Carrizo. It relies on the same Steamroller cores as Kaveri, hence the title 'Kaveri Refresh', and has the same underlying architecture as Kaveri. Ultimately the A10-7870K is the same core and same architecture underneath, but with a few added benefits detailed below. When it comes to naming, a number of sites and publications within the media have called the new line ‘Godavari’, and where the name Godavari comes in to all this is down to AMD's internal codenames rather than anything put forward by marketing. We were told that any slides published with that name are usually aimed for internal AMD or B2B use, but that also the ‘Kaveri Refresh’ indication was again, an internal codename. One could argue the merits in using either codename, and I’m sure the ‘Godavari’ moniker will run riot, although I think Kaveri Refresh more accurately describes the new APU launch and subsequent models to follow. AMD is launching one consumer APU to begin with, with more (both consumer and commercial) to follow in the coming weeks and months. The purpose of the A10-7870K is to show that AMD is working at improving the silicon process and is able to achieve more with the same. 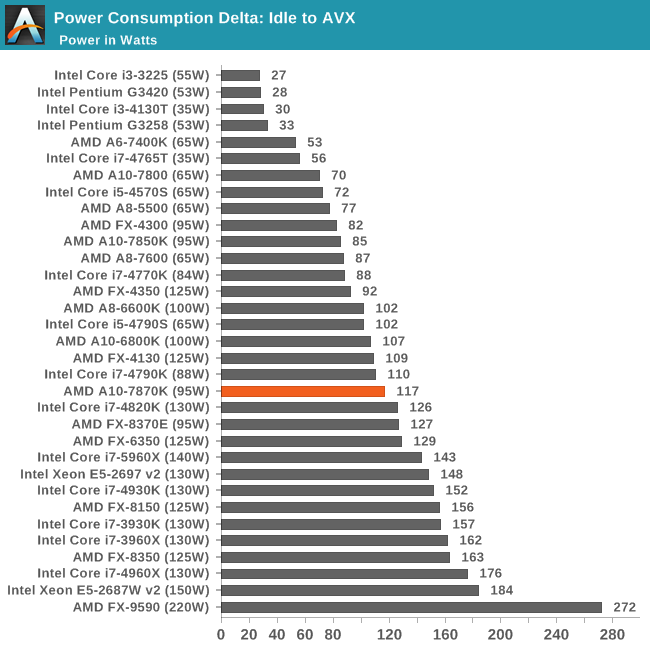 The home hitting statistic from the new APU is a jump in clock speeds compared to the previous king of APUs, the A10-7850K. The bottom line is a bump in base frequency to 3.9GHz and turbo frequency to 4.1GHz giving more grunt in common tasks. The bigger jump, and arguable the more important, is the integrated graphics. We move from 720 MHz to 866 MHz, a boost of 20% on the 512SP core. With AMDs heterogeneous system architecture approach on the APU line, this is arguably the best place to put any potential increases due to process improvements and better binning. When speaking to AMD, it transpires that this boost on the Kaveri design is due to three things: an improved process, binning, and a marginal voltage increase (which is doubly effective due to the binning). 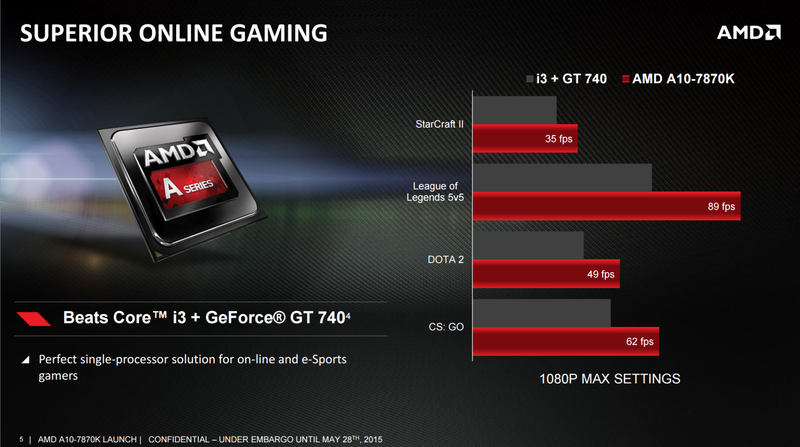 The stock voltage of the processor goes up 0.050 volts compared to the 7850K, although AMD still reports a 95W TDP. Usually stock voltages are listed as a range depending on the quality of the die, but on average that window is slightly higher this time around. But as the TDP is similar, this ultimately should not matter that much. We have our power testing later in this review. Our previous benchmark numbers show that in pure CPU workloads, AMDs architecture has a tough time in single threaded loads that do not rely on memory. Multithreaded loads also seem to take advantage of the hyperthreads of Intel better than the core design of the Bulldozer base architecture, although some benchmarks and workloads (particularly those that can be accelerated with the internal graphics) favor AMD. Where AMD pulls ahead is typically on the graphics side with the integrated solution of 512 SPs getting better frame rates in both regular and high end titles against a 24/20 execution unit Intel variant. Based on paper alone, the 20% boost in frequency to the 7870K would further cement that lead. However 20% clock speed does not guarantee 20% more performance, especially as top titles are becoming more multithreaded and/or memory bandwidth intensive. 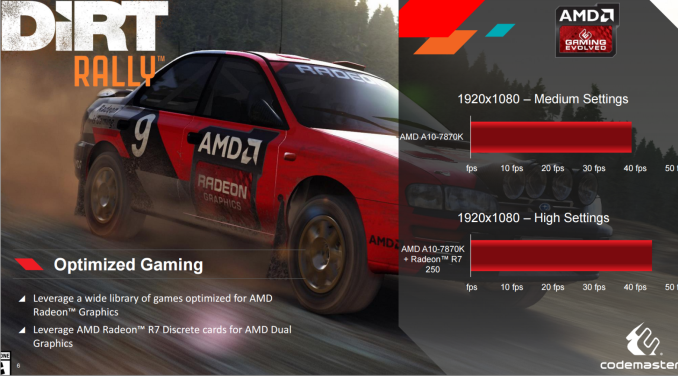 AMD’s strategy at this point is simply that discrete cards go after AAA titles while the APU line grapples with games appealing to a more mass market, or mass audience. The key line in the promotional material we received was all about how an inexpensive system can tackle the common adversarial titles of the generation. AMD suggests DDR3 cards over GDDR3 cards purely to keep memory types similar, although at some point it would be interesting to see the comparison between the different types. For our testing we are using the R7 240 DDR3 model from ASUS, a small $70 discrete card. Another element AMD is promoting with the Kaveri Refresh line is an upcoming feature in DirectX 12: Multiadapter Rendering / Asymmetric Rendering. DirectX 11 only allows single threaded operation by default with alternate frame rendering, by comparison. The principle behind asymmetric rendering means that each graphics adapter in the system can be identified by its speed and capabilities and assigned an appropriate identifier. Then, at the engine level of the game (making this feature title dependent, not driver dependent) batches of work can be dispatched according to priority, complexity and required efficiency to each of the rendering capable devices in the system. The results are collated into the graphics output. The example we were given (which I have seen in the flesh) is with the Oxide Games/Stardock upcoming title Ashes of the Singularity. I spoke extensively to Dan Baker of Oxide Games and he states that the concept is relatively simple making it easier for programmers to dive in, and implementing it into their engine for the game took some time but they found a substantial benefit. Ashes of the Singularity is designed to be a more classical type of RTS based in the future, with plenty of units on hand as well as scenery and effects needing to be rendered. In the screenshot above, the red and blue colored items represent the different items that are rendered and the color shows which graphics in the system supplied the processing power. In this case the APU took care of the red units, while the discrete GPU did the scenery and a good portion of the effects. In the demo I was at, enabling the APU in this circumstance gave a 10% performance increase in a heavy 30 FPS scene to 33 FPS. It doesn’t sound like much, but any opportunity to use more of the system that the user has paid for is always a bonus. I asked regarding multiple discrete cards, such as dual R9 290Xs, and he said it wasn’t a problem by the way they had built their engine. While we do not have access to DX12 and Asymmetric Rendering capable titles as of yet, we are hoping to work closely with developers like Oxide in order to test the main public releases under the new feature sets. Stay tuned. 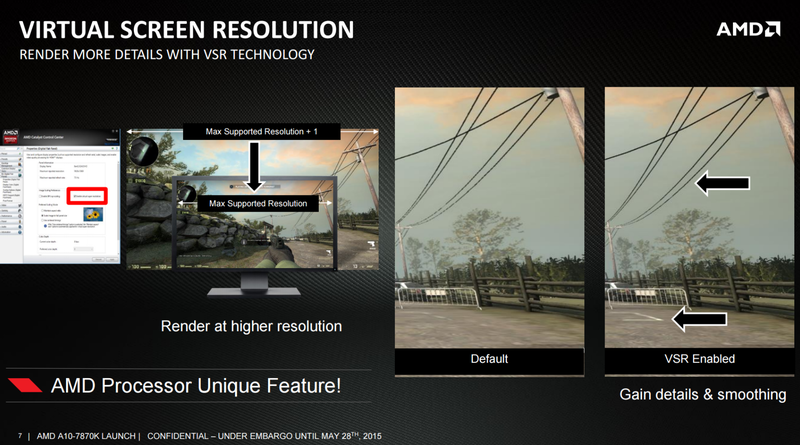 A new feature coming to the APU line, present on the high end graphics cards, is Virtual Screen Resolution. Similar to DSR, Virtual Screen Resolution is a driver level feature that allows the APU to render at a resolution higher than the monitor is capable and then scale the resulting image down to the actual screen resolution. Benefits include better aliasing, allowing both in-rendering algorithms and post-processing to essentially work on a larger image, as shown above. Obviously this comes at a price, namely performance. On the APU side it might be argued that VSR is not a great technology as typically people will game at lower resolutions anyway, or at 1080p with low/medium details while being limited around the 30 FPS barrier. The main plus point would be for devices that are resolution limited, say 720p, allowing them to render 1080p offscreen and then scale back in. Back to the A10-7870K specifically, AMD is stating that due to the Kaveri Refresh nature of the SKU, it will be suited to all FM2+ capable sockets and motherboards that conform to AMD’s specifications. That last bit is particularly important, based on information I received from one of the motherboard manufacturers that specifically released new motherboards for Kaveri Refresh. The motherboard manufacturer stated that they released new motherboards because the power draw for the graphics portion of the APU is now more substantial than before, and they wanted to implement an element of security into their products. Needless to say, it allows OEMs and system builders to provide a ‘more up-to-date’ motherboard when providing systems around the A10-7870K, but AMD were quick to respond by saying words to the effect of ‘any motherboard on the A88X/A78/A68H/A58 chipsets that use an FM2/FM2+ to our specifications will work with the Kaveri Refresh line’. So there you go. As I mentioned at the top of the page, there are a number of supposed ‘leaks’ floating around the internet recently, with a larger-than-normal proportion of them being obvious fakes in recent months (perhaps there’s a sale on faked slides or something) and others being convincingly near the real thing without being confirmed by AMD. 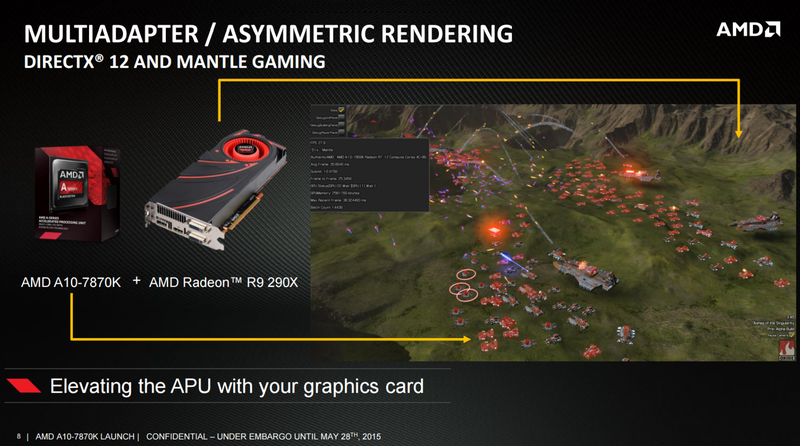 As a result, without direct confirmation from AMD, it’s hard to say what is real or not. Some websites will be stating that one or two or more APUs were released at the same time as the A10-7870K, but we’re only going to report here what we have been told directly by AMD in this instance. 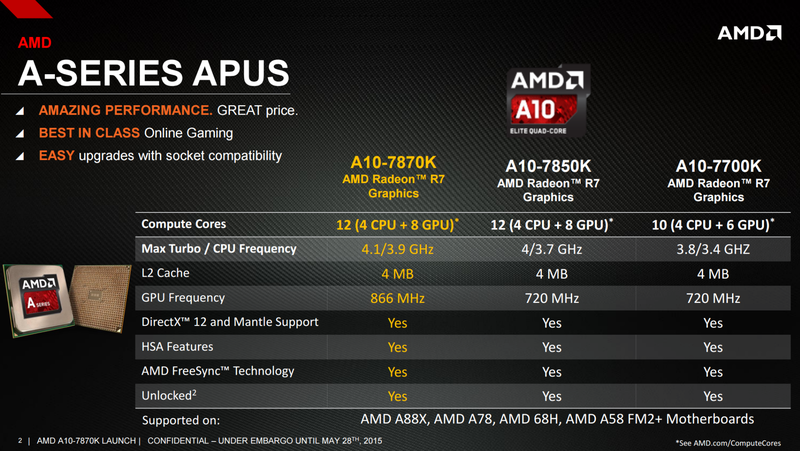 At present, only the A10-7870K was officially launched on May 28th, and will retail in the channel for $137. 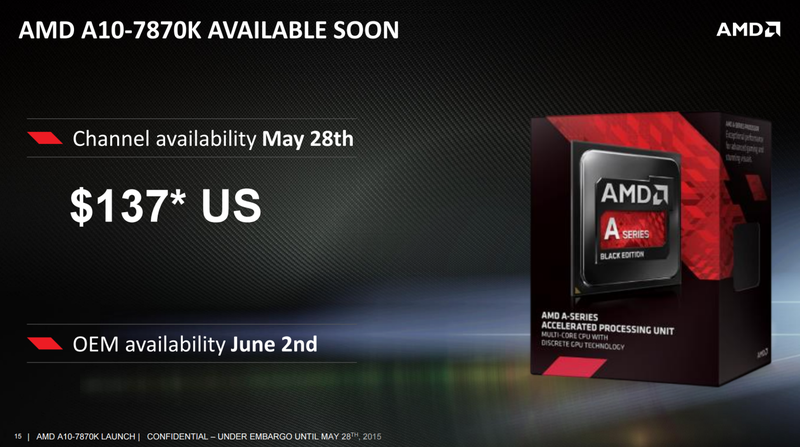 OEM availability for the A10-7870K will be on June 2nd. Over the next few quarters, several more members will be added to the Kaveri Refresh family for both consumer and commercial, with a different naming scheme coming to the commercial side to account for generational updates to AMD’s customers. The details of those models have not been officially released to the public, and personally I have only heard broad speculation or seen unconfirmed slide mockups. As with our other APU coverage in recent weeks, we are taking the A10-7870K for a spin in both regular, office, professional and gaming tests as well as some basic overclocking. Unfortunately due to the timing we failed to finish the last one or two tests before travelling to Computex, but these results will be added to our database later in the month when we return. There’s still over 100+ new data points for the A10-7870K to cover, and as usual the more modern tests results will be compared to here in the review but all the data points, including legacy and long-term benchmarks such as Cinebench 10 and POV-Ray, are in our benchmark database Bench. 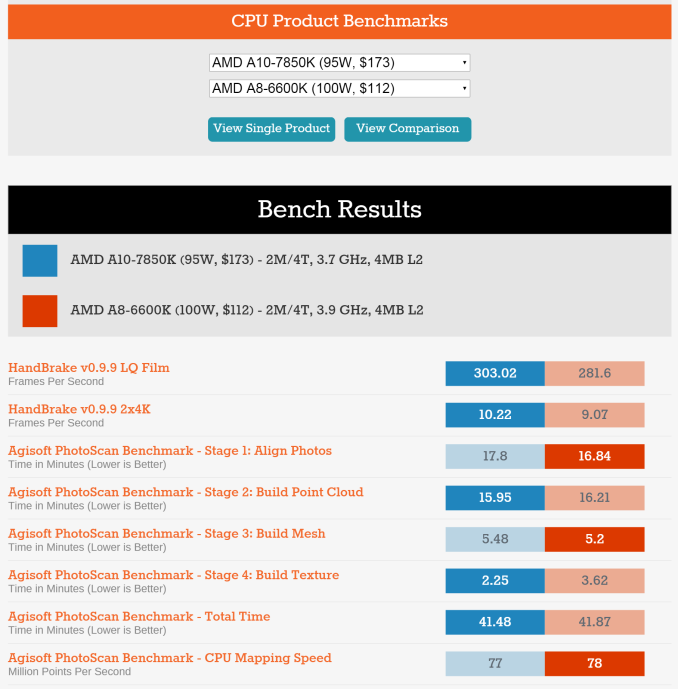 Head over there for specific benchmark comparisons or select two processors for a direct A vs B shootout for common benchmark data. Those that have read my last couple of reviews would have noticed that we recently incorporated a pair of AMD R9 290X graphics cards into our CPU testing. These were kindly provided by the AMD UK/EU office in order to give us a comparison point for high-end AMD discrete performance. 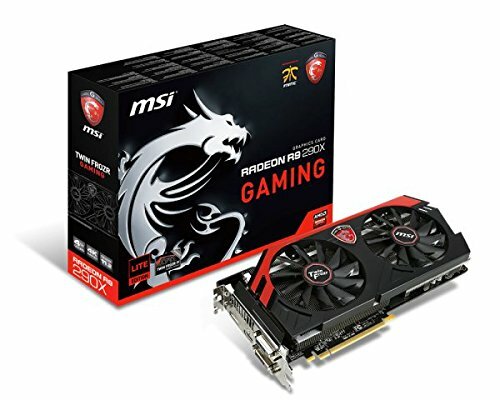 They supplied two of the MSI R9 290X 4GB Gaming LE models, which is one of the more cost effective R9 290X models allowing a full 2816 SPs per card. We are using these cards in our game testing and both of them in Crossfire when it comes to Shadows of Mordor in 4K. Power consumption was tested on the system while in a single NVIDIA GTX 770 configuration with a wall meter connected to the OCZ 1250W power supply. This power supply is Gold rated, and as I am in the UK on a 230-240 V supply, leads to ~75% efficiency > 50W, and 90%+ efficiency at 250W, suitable for both idle and multi-GPU loading. This method of power reading allows us to compare the power management of the UEFI and the board to supply components with power under load, and includes typical PSU losses due to efficiency. We are reporting the power consumption difference when idle and during an initial OCCT load. This is slightly skewed by the adjustment up the efficiency chain of our power supply, showing lower power CPUs consuming a little more, but despite this the qualitative comparison is a still a good place to start. At 117W in our test, it seems a little over the 95W TDP listed, especially when the 7850K achieved 85W and under its 95W TDP. There will be variation within a SKU based on the binning quality, as I doubt the average 0.050 volts added to this SKU as I was told by AMD accounts for this much. Perhaps we ended up with a good 7850K sample but a mediocre 7870K sample. Alas with 100 CPUs we might get a better histogram of performance here, but we rarely get more than a single unit. "the release of a Kaveri Refresh line of APUs is not going to set the world alight in a miasma of queues outside brick and mortar stores or bundles of pre-orders"
~"People wont be lining up around the world to buy them when they are released"
Well, if that remains consistent, then Godavari should be able to overclock the GPU to 1142MHz. If the Kraken and Sunspider test results are correct, they are nonsense... The extra 100 megahertz makes the 7870K 15% slower on Sunspider compared to the 7850K, while it is an equal percent FASTER on Kraken.